To me, tattoos are most often a public display of insecurity. When one is insecure, that person tends to do one of two things, either brag about their deeds in the particular area of insecurity or mask that insecurity by distracting somebody’s attention elsewhere. 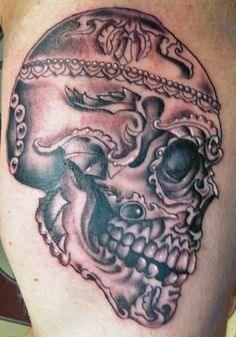 It is for these reasons that the largest majority of those with many tattoos are most often seen among the segment of the population that has not really accomplished anything positive in their life, namely criminals, gangs and the insecure. When I look at peoples’ tatties I use their artful (perhaps) ink to see what personality flaw or weakness they are trying to hide or what circumstance in their life they are trying to boast about, or even if they bear a particular tattoo as a statement of contempt. The tattoos that I believe to be the most disgusting are the tattoos that are obviously meant to intimidate people. These are tattoos similar to prison tatties or gang tatties. By example, there is the famous tear drop (shown above in the featured jpg). Each tear indicates an individual that the bearer thereof is claiming to have killed. [With the new order of criminals, this only applies to gang members these days]. The problem with this tattoo is it doesn’t tell us whether or not the tattie bearer killed his victim in an act of cowardice. Perhaps he assaulted the victim with a sneak attack like Blair Beaudry tried on me. It does tell us this though. It tells us, if the tattoo was truly earned, that the individual in question is very sick. If the tattoo was not truly earned, then that the individual is also very sick. Who but the mentally diseased would brag about having killed somebody, whether true or not? The type of person who wears the tear drop reminds me of Wyatt Prince. 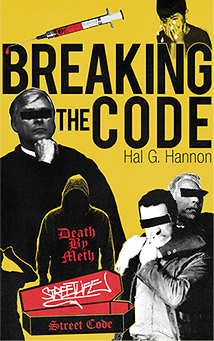 Much of my book, Breaking the Code is about Wyatt. He came to me the night of a murder actually bragged that he had just killed the person. 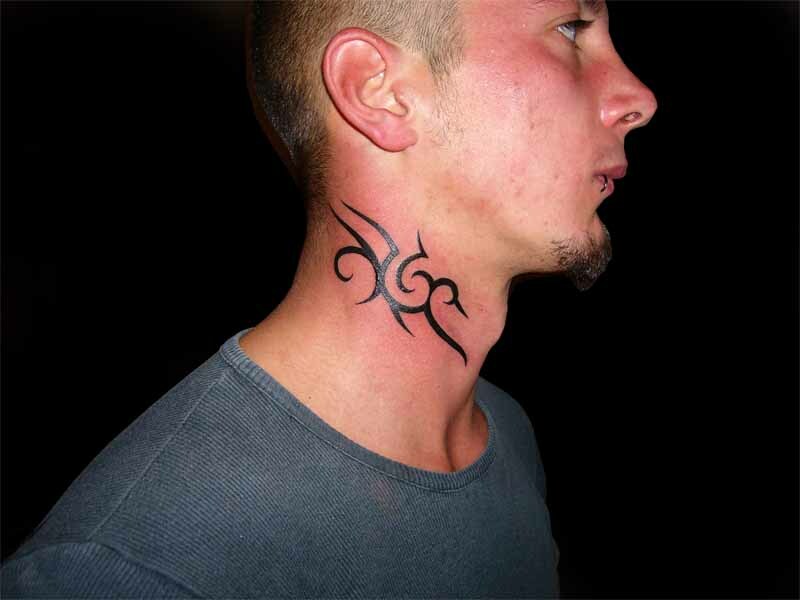 These types of tattoos are obviously meant to intimidate and to give the bearer a sense of self identity. 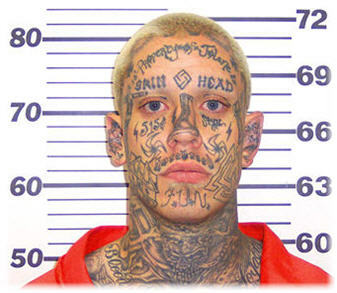 When I see these massively tattooed gang bangers, I see individuals that grew up tough and grew up lonely. I also see a person that is driven to live up to the persona that he is trying to project with his tattoos. To me, this type of person is more than likely more of a broken person than a sick person. My gut feeling is this person is dangerous when backed up by his buddies, but a person with whom one might engage in a meaningful conversation if one on one. These are the personality types that just want to make an impression on people because their personality is incapable of doing so. I basically look at these males as wannabes. If you look at the types of tattoos they wear, they wear skeletons, skulls, ghouls, etc. At a deeper psychological level, I believe this group is the most insecure and that their tattoos are representative of how they feel about themselves and their prospects in life. I get it, one or two tattoos somewhere on a male’s arm or chest is a simple statement. It is often about who they are. Other times it is about who they would like people to think they are. Often it is about a club or service group affiliation of which the bearer is proud. Such tattoos, nevertheless, reveal something about the personality of the wearer thereof, especially if they depict evil. At a deeper psychological level, these types of tattoos indicate to me that the male bearer simply wants to honor those whose name he bears. I somewhat question the security level of those who ink themselves in this manner. These individuals could better show their love through their actions, as opposed to having their bodies inked. After all, if they think that their child or girlfriend needs to see their name inked somewhere to feel loved, what does that say about the security level of the wearer thereof as to how he feels regarding his ability to project love? These tattoos seem to represent an attempt to make people think that the bearer of them is a tough guy. This thinking is born out by the fact that most such tattoos are depictions of things such as lightening bolts, or edged weapons or are words such as, “thug”. They are an indication that the bearer thereof has a deep insecurity about his maleness and is trying to project an image that hides what he considers a weakness. While meant to attempt to intimidate the males whom he might encounter, they are also present to attempt to impress the women he might encounter. This, at least to me, seems like an act of total disrespect as it becomes a statement of ownership. It treats the woman like chattel and shows more interest in her body than her heart. You don’t own a woman. If you are lucky she gives you her heart. Then no statement needs to be made to the world telling it that she belongs to you. If she does give you her heart, the world will know by the way you treat each other. As I said in my book, Breaking the Code, you brand livestock, not women. Branding women is tantamount to woman abuse. If your boyfriend asked you to have the tattoo, read the above and ask yourself why he wants it there, and by “there” I mean on your body to begin with. Even more telling though, why does he want it on any particular part of your body? 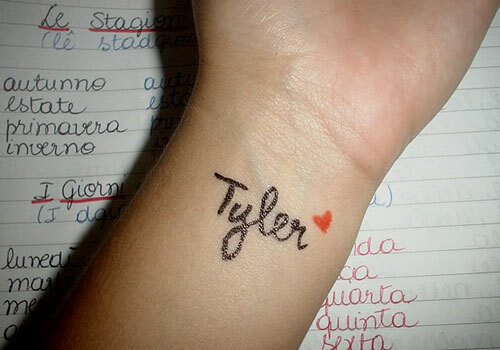 If it is your idea and you really want to ink his name on you, you need to ask yourself a couple of questions. Are you going to be together forever? Are you bearing his name in the hope that you will be together forever? Is the tattoo to make him happy instead of you? You need to think very hard about this decision. Well over ninety percent of women grow to regret their tattoo(s), often in short order. Unlike a tattoo, love is probably not forever. 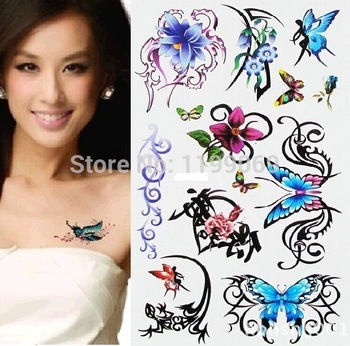 Of all the tattoos I find these are the least offensive and I understand the desire to self-decorate. To these ladies I say please think about how that tattoo will look as you age. I also remind them that their exist decals which can they can apply to their bodies. These decals create the same visual effect as a tattoo, but without the years of regret that might follow. I know this very sweet young lady who has tattoos head to shoulders and cheeks to cheeks. As artful as her tatties might be, I would just like her to know that she was beautiful without them. She needs to know that it is her heart that makes her beautiful. Her body is simply the canvas upon which the various artists practiced their craft. I’m certain that the same could be said of many of the women who bodies are similarly adorned. Obviously, one of my pet peeves is tattoos. As far as I am concerned, especially among the male population, a tattoo is most often nothing more than a statement by the bearers thereof that their persona is incapable of projecting who they really are. That’s my opinion, what is yours? I was very impressed with the first 3/4 of your process, then you got to the women and turned into a pansy. Women get tattoos for the same reasons, insecurity and projection. 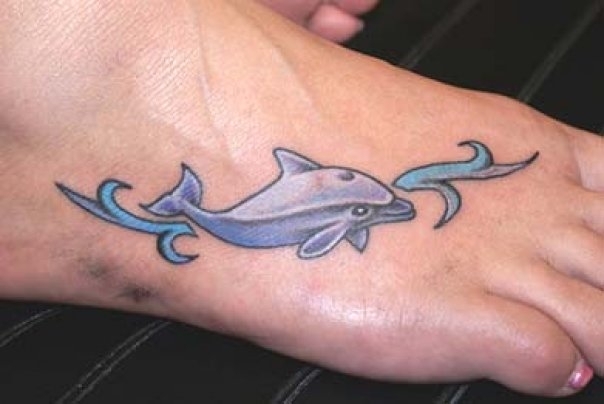 Women who have a few girly tats are projecting they are sweet girls, they’re usually not. Women with a few aggressive tats are projecting they are GoGirl tough, they are not. Women who tat a lot are almost always very promiscuous and projecting they’re DTF. Why soft sell the ladies? I admit that I tend to go a little easier on women. Nevertheless, I believe my statement, a far as they went, are accurate. That said, I appreciate your points. Thank you for the feedback. Tats, the more one has the more insecure and in demand of being noticed they definitely seem to be. Very low self esteem and thriving off the attention the tat/tats bring them. Usually for most males it’s a statement of how tough, bad they want others to perceive them to be. Most of the time it’s a weak minded individual.